Microsoft Excel is a leading software program for working with spreadsheets. Most likely, no other software is as commonly used for tables; and .XLS and .XLSX formats are also so common for storing and exchanging table data that they could also be considered standard. Consequently, wpDataTables could not be looked upon as a fully-functional tool if it wouldn’t support this format as well. You can download the Excel file used in this tutorial by this link. See the resulting table first, and the step-by-step tutorial to create it below. are highly not recommended, because the table in the wpDataTable plugin will not work, at the moment. If you make any of these changes, please recreate the table again. 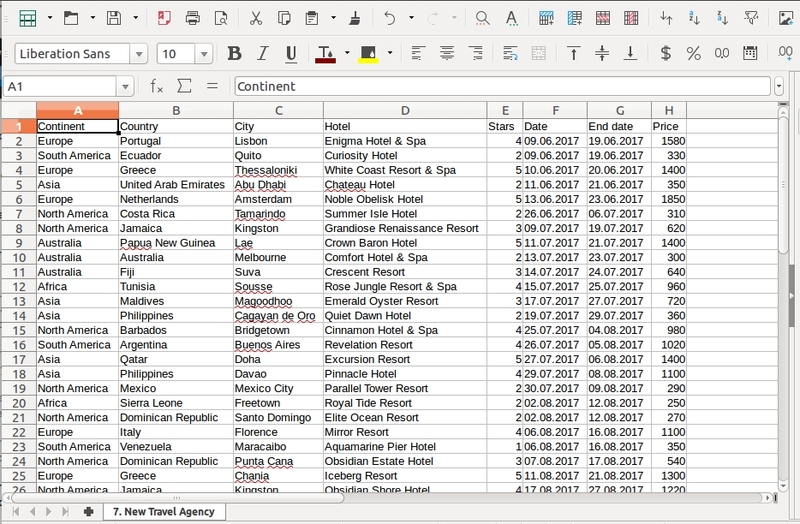 They generally work slower than CSV-files, or even Google Spreadsheets; so if your table is large, it is much better to port it to a different format, or – even better – to MySQL table (you can use “Create a table by importing data from data source” to import your Excel file to MySQL). First, prepare an Excel file with your data. It doesn’t have to necessarily be prepared in MS Excel, it can be prepared in other software – e.g. OpenOffice or Libre Office. The necessary thing is to save it in an .XLS or .XLSX format. Once the .XLS or .XLSX file is prepared, you need to create a wpDataTable in your WordPress admin which will pull the data from it. Click on Create a table linked to an existing data source. 3. Provide a name for the new wpDataTable in the “Table title” input to help you identify it. 4. Select “Excel file” as Table Type. 5. 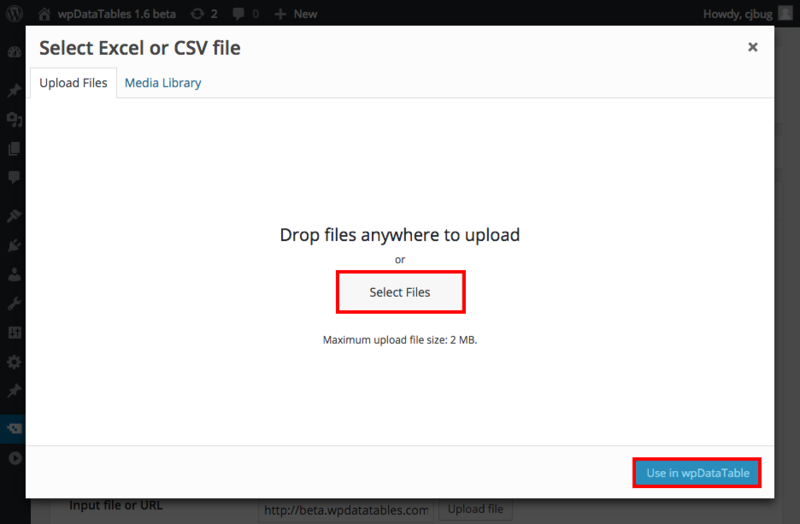 Click on the Upload file button to open the WordPress media library. 6. Upload the Excel file that you prepared; then click Use in wpDataTable. 7. Click “Save” so wpDataTable will read the column structure and save it. Note: Your Excel file should be on the same domain as WordPress. When the table structure is read from the Excel file, you might wish to define additional settings for the table (responsiveness, table tools, layout, etc.) and for individual columns (column data type, filter, change the displayed name). You can read this documentation section for all the details related to different table features, and this documentation section for descriptions of different column features. In this example table, we defined the filter type for the “Star“ column as “Number range“. To achieve that, you will need to open Column settings. 2. Or, by clicking on the yellow button on top of the table. 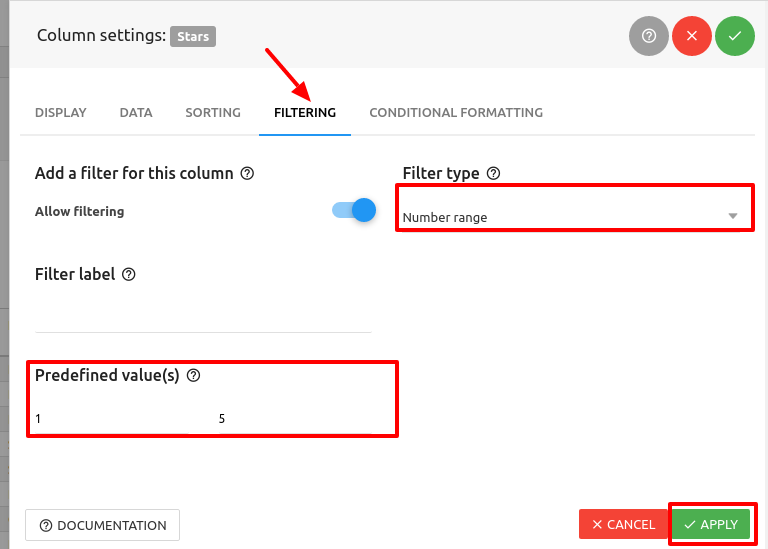 In this dialog you can quickly rename, reorder, or toggle visibility for columns. Now, you can click on the Filtering tab, and for the filter type select Number range for the “Star” column. Also, we will define the value that will be set as a default predefined filter value on page load. Let’s set that, for example from 1 to 5. Now that we’ve configured our table, click on the Apply button. When you’ve finished preparing your Excel-based wpDataTable, you can insert it in the post or page. Create a post or page, or open one of the posts/pages you already have for editing. If you prefer, you can just copy & paste the generated wpDataTable shortcode. When you save the post or page, and open it in the front-end, you will see the wpDataTable generated from your Excel file. Now you have Excel in WordPress.